What were you doing on this date in 2001 when you found out about the collapse of the Twin Towers and the tragedy at the Pentagon? My life has been so hectic as of lately that until just yesterday I did not even realize that this day had approached so quickly. It feels like just yesterday that we were remembering the 10th anniversary of this great tragedy. The whole incident seems so surreal. I know it happened but it just seems so impossible. It seems unreal that so many innocent lives were lost in just a blink of an eye. Just thinking about this day makes my eyes misty and gives me a sinking feeling in my chest. At the time of this horrible event I was living in northern NY with a roommate. At that time in my life I was pretty lost and I spent too much time drinking and in the bars. I didn’t have direction in my life because I was young and just pretty clueless. I slept through the morning and my roommate knocked on my door a little after 10 and told me I should come out and see what is on TV. I dragged myself up not expecting to see what I did. On every television station there were images of the twin towers collapsing and people in the streets running for safety. It was mass chaos. I immediately thought that it couldn’t have been real. For hours we both just sat on the edge of our seats watching the news reports and watching the death toll rise. It completely broke my heart knowing that so many innocent lives were lost that day….the innocent lives of not only adults but also of young children. To this very day I still don’t understand why any of it happened. I don’t understand why violence has become the answer for so many in our world. I take great pride in my country and I feel lucky to live in a country that does not have the wars that other countries have and I have the freedoms to live as a woman without fearing my safety. This event was so very horrific and tragic but inside of me I still believe that an eye for an eye is not the answer. We will never resolve violence with violence. I detest that people from my country that I take pride in had to lose their lives or lose their loved ones but I also hate that in so many other parts of the world both men and women are tortured, raped and murdered and this is a normal everyday occurrence. This day reminds me of how divided our world is but it also reminds me how strong this country is. On this day, the people of the United States stopped seeing all of the differences and came together to help however and wherever they could. The people stopped and told each other they loved each other and realized how precious their lives were. Where I lived in NY was about 8 hours from NYC and I remember that classes were cancelled for the remainder of the week. I remember trying to call my parents (they had moved down to South Carolina) and the phone lines were completed jammed for hours upon hours. Everyone was trying to call their loved ones and trying to find those that they knew had been in the Twin Towers and the Pentagon. I had friends that lived right over the bridge in Connecticut and they said that the smell of death just lingered in the air for days. I can’t imagine being so close to any of it. My heart sinks just thinking about it but I am unable to fathom what it must feel like for people that lost family members and friends or to be wandering the streets of NYC and witness the falling of the Twin Towers and then mass chaos breaking out. 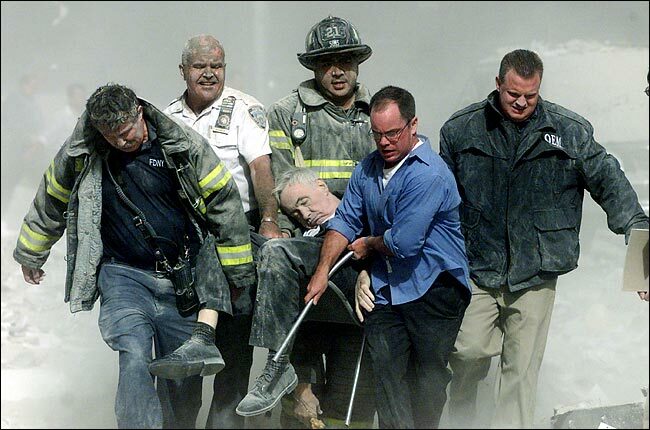 The image above is one of my favorite images to remember 9/11 because it shows so much love….it shows a father’s love for a son and the sadness he feels for losing him too early. The whole incident was completely unfair…people should not have to experience this kind of pain. People should not have to bury their loved ones because of others hatred. The picture above is beautiful because it depicts so much love but it is also one of the saddest pictures I have ever seen because you know that a part of this man is now missing. I have watched several documentaries about 9/11…..about different people and about different situations and theories. I watched a documentary called The Saint of 9/11 about a priest that also was a volunteer firefighter. This priest was not young like many of the volunteer firefighters at the time of his death (I believe he was in his late 50’s or 60’s). This man had to be one of the most noble, selfless people I have ever come to learn about. He lost his life on 9/11 while trying to save the lives of the innocent in the towers. He lost his life doing what he was meant to do…helping others. If you ever get a chance to check out this documentary I highly recommend it. Yes, the events of 9/11 were extremely sad but this film brings you to a place where you learn and remember the importance of human kindness and selflessness. On this day I ask all of you to remember love over anything. We should do this every day but sometimes with the craziness of life we forget. We as people (not just of this country but of the world) need to strive to come together instead of driving each other further apart. Tragedies like this need to lessen over time, not become the norm of the world. So remember what is really important to you and remember who is important to you and take the time to tell them you love them. It may be cliché to say but it is so true: Tomorrow is promised to no one. I was 15 when it happened and I was studying history at home (homeschooled) my dad came home and told us about it. I remember the details down to what I was wearing. I was devastated but I think it has more of an impact on me now than it did then. Maybe because I’m older and a littler wiser and understand what has really happened and how much it changed everything. I’m NYC born and raised, now living in the South (Charlotte) for the past 12 years. 9/11 was a massive psychic wound for me. I remember that morning feeling pretty aggravated about work. I was walking towards my office building when one of my co-workers, a Jersey ex-pat, pulled his car over and told me to get in. We were listening to the news when we heard the news about the second plane crashing on the North Tower. My first instinct was to call my family and make sure they were all accounted for. Luckily, none were employed near the WTC site, but nonetheless not being able to contact anyone back home for a few hours was pretty harrowing. I’m glad there’s little empty rhetoric from the politicians today. It disgusted me how crassly they co-opted 9/11 for their own gains. 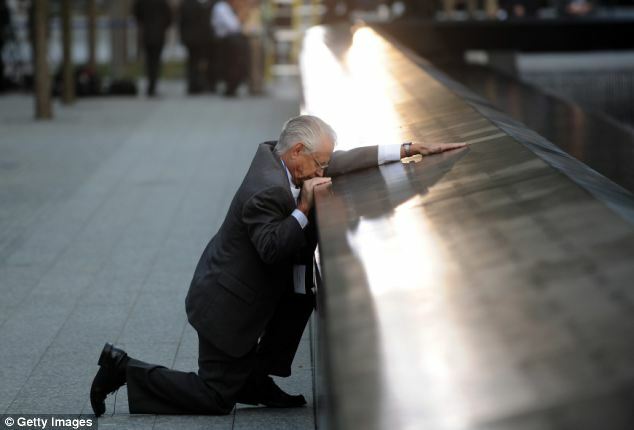 9/11 should be remember with quiet grace. The day before, I took a much needed break from my then husband’s hospital bedside to celebrate my oldest’s birthday. As a present, I had managed to procure two tickets to Michael Jackson’s last concert at Madison Square Garden. The concert ran late into the evening so we decided to stay in NYC for the night. We got on a NJ Transit train at 7:40 AM on 9/11/01 and watched in horror from the NJ side as a plane plunged into the first tower. To this day, it is a surreal memory and along with the gratitude I feel for being able to get on the train safely when we did, I feel immense sadness for everything else that transpired that day. I was 36 and living in Darwin. I was in bed and watched it unfold on television.